Dear College Students, welcome and welcome back. Although I have (very sadly) outgrown my college days, I still have a few tips to offer to stay on budget while balancing schoolwork, social life, jobs, finances, and more. I did graduated with my graduate degree less than a year ago, so hopefully my advice isn’t woefully out of date… just yet. 1. College discounts: You know that little ID card you need to take everywhere with you, yeah, take off-campus as well to score some discounts off food, retail, entertainment, and more. Also, if you’re not sure if the company offers a college discount, it doesn’t hurt to ask. There’s a big list of college discounts on this blog here and don’t forget to ask your own college if they know of any college students just for your own particular school. 2. Participate in Student Activities: As an undergrad student, you pay a student activity fee that brings comedians, bands, jugglers, and more onto campus as well as other fun events without traveling very far: all for free. Please take advantage of these, you will definitely miss the free and convenient entertainment when you graduate. Most office of student activities are social, so follow them on Facebook, Twitter and more to find these free events on campus or read some event posters in the hallways while waiting for a friend. 4. Spend smartly with textbook purchase: Please don’t wait until after your classes begin to purchase your textbook, especially if there is limited supply at the bookstore. If you put off the textbook purchase too long, you may be stuck buying a brand spanking new book instead of getting an used or rental book for much less. Sometimes, it can be a strategy to share a textbook with a friend or wait until you’ll actually use the textbook, but often times you can return your textbook (ask your bookstore about their policy) within the first few days for a full refund so if you don’t need it, you can return it. Also, sometimes your campus library may have a copy or two of the textbook that you can borrow at the library, so check there if you have a funny feeling you won’t need your text all that much. With even more planning, buy online to save even more. It may take a week or two to arrive, but you can save big bucks by buying (or renting) a book online. For those procrastinators, think about Amazon Prime (referral link) because you can score free two-day shipping so your textbook can arrive to campus quickly. There’s even a free prime trial for students, so don’t pay for your two-day textbook shipping this semester! 5. Going out? Plan ahead: If you do decide to go off campus, figure out your plan ahead of time. If you are going out for drinks, recommend a bar with $1 drafts or a restaurant that’s having a $2 taco night. By picking the right restaurant for your budget, it can save you a lot of money. Take advantage of free museum nights and just hanging out at Boston Common; you don’t need a lot of money to have fun. Also, when are going out, put aside how much money (cash) you’d like to spend that night in your pocket. If you don’t have the money in your pocket, you won’t spend it– or at least you’ll think twice when you are reaching for your debit card. Plan ahead and pay a little less for having a lot of fun. Hope you have a great year! Do you agree with my advice– what did I miss?! Red Sox College GREEK Night at Fenway Park on Thursday, April 25, 2013! Attention GREEK College Students: Thursday, April 25th is the second College Night at Fenway this season, especially for Greeks! You can grab tickets for $30 (Standing Room Only) with $10 Sox Bux onto your ticket for concessions as well as a free fan cave t-shirt. Also, $2 hot dogs and $1.50 pretzels will be available in the Championship Club as well as other perks for greek college students. Reminder, you can still grab additional discount concessions for the entire month of April as well. For more information or to grab your discount tickets, please click here. Red Sox College Night at Fenway Park on Friday, April 12, 2013! 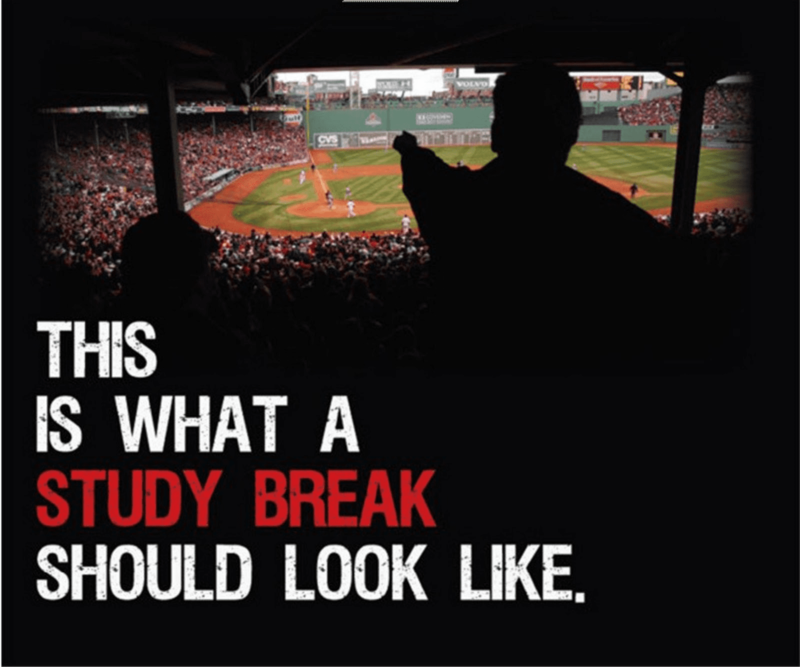 Attention College Students: Friday, April 12th is the first College Night at Fenway of the season! You can grab tickets for just $12 and a free fan cave t-shirt as well. Also, $2 hot dogs and $1.50 pretzels will be available in the Championship Club as well as other perks for college students. Can’t make it to this Friday’s College Night? The next one is scheduled for Thursday, April 25, 2013 according to @RedSox on Twitter. 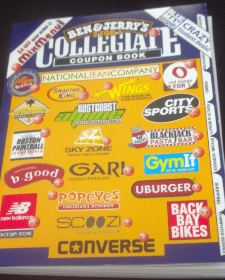 College Students: Boston Collegiate Coupon Book Spring 2013! College Students, keep an eye out for the Spring Version of the Collegiate Coupon Book. Your best bet is to check with your Student Affairs or Student Activities office first if you haven’t seen them on campus before. Make sure to keep an eye out at your local college for this coupon book to score these great deals + many more! Most coupons expire in August of 2013! All winter long, college students can ice skate at Frog Pond on Boston Common for just $2.00 every Tuesday for College Night! Make sure to bring a valid college ID. To check out ice skating conditions on Frog Pond, go here. Looking for more college discounts? Please check out Boston on Budget’s list of college discounts in and around Boston here. CollegeFest & Museum of Science College Night! I know I mentioned yesterday that tomorrow (Saturday, Sept. 22) is College Night at the New England Revolution game but I also wanted to highlight two more events coming up especially for College Students! Also, on Monday, September 24, 2012 is College Night at the Museum of Science! Visit after 5pm to receive Free Admission with a valid college ID! For more information, please click here.